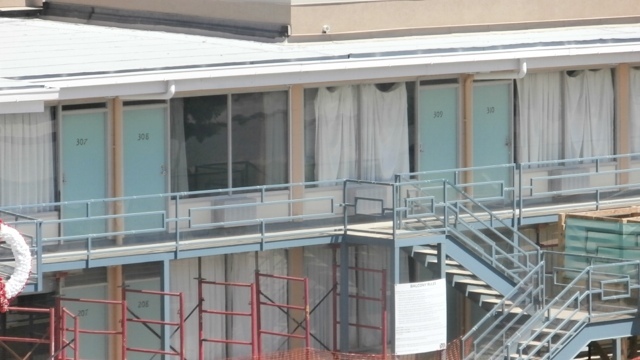 Today (June 11) we visited the National Civil Rights Museum in Memphis, TN, which is located on the site of the Lorraine Motel (pictured below) where Dr. King was assassinated on April 4, 1968. Dr. King was in Memphis to lend his support to black sanitation workers that had been trying to form a union for several years and to gain basic things like a living wage, health care and better worker conditions. Though they were public employees employed by the city they received lower wages and fewer benefits than their white counterparts. Furthermore, they were never allowed to apply for promotions. Even though these workers put in their 40 hours, their income was below the poverty line. They came to work in hand me down clothes and had no work security. That is why they wanted a union. However, the city did not enter into good faith negotiations with them and so eventually they went on strike. Their main slogan was “I AM A Man”, i.e. I am someone with dignity who should be treated as a full human being. The mayor of Memphis refused to negotiate with the workers saying that the law forbid them to strike. Eventually they did go on strike in defiance of the mayor’s edict. By 1968 Dr. King had begun to connect the racism in the country with issues of poverty and war. To that end he and his advisors had begun to plan a Poor People’s Campaign in which thousands of people would build a tent city called Resurrection City on the Mall in Washington, D.C. (reminiscent of the 2011 Occupy Movement) When Rev. Billy Kyles, a local pastor and civil rights leader, invited King to Memphis, he jumped at it because the garbage workers strike linked the issues of poverty and racism. He lad a march to the downtown area that unfortunately turned violent; King was vilified and ridiculed for not being able to lead a non-violent march and so returned to Memphis a few days later determined to lead a non-violent march in solidarity with the workers. On the evening of April 3, he delivered his famous “I Have Been to the Mountaintop” speech, in which he alluded to his own death. The next day he was assassinated on the balcony of Lorraine Motel. There are many things that touched me about the story surrounding his death – the events leading up to it; the linking of poverty and racism; King’s own struggle with depression and fear of his own death; the camaraderie and commitment of all the people around him. However, as I reviewed the story of the garbage strike, I could not help but think of the current struggle in Philadelphia that the interfaith network POWER and baggage handlers and other airport service workers are having with the the city government right now. Like the the garbage workers, these airport workers are earning poverty level wages without health benefits or job security in very physical jobs where injuries can cost you your job. While technically they work for the airlines because they are outsourced workers, really they are working for the airport which is governed by the city. POWER and the unions have been advocating for living wages and benefits for these folks. Also like Memphis, most of these workers are persons of color. It’s Memphis 1968 all over again! If we want to honor the “dream” of Dr. King, it must start with addressing the inequities for which he gave his life.